The two biggest pieces of cardio equipment on the market are the treadmill and the elliptical, but these two things often present too much of a compromise for the average home fitness enthusiast. With a treadmill, cardio training can be damaging to the knees and painful on other joints as the body impacts the belt. With an elliptical, many people feel as though they’re not getting the same high level of cardio training as they would from running. The Gazelle Supreme seems to be the perfect compromise between these two camps, offering a full range of motion that puts no strain on joints and leaves behind the circular, flywheel-like motion of the elliptical. With the Gazelle Supreme, it’s easy to run, walk, or participate in any of 10 unique exercises that provide excellent cardio training to people of all fitness levels. This elliptical made it to our top picks for the Best Elliptical Machines of the year. There is no motor or flywheel used in conjunction with the Gazelle Supreme, which means this equipment has no ongoing power requirements or costs. 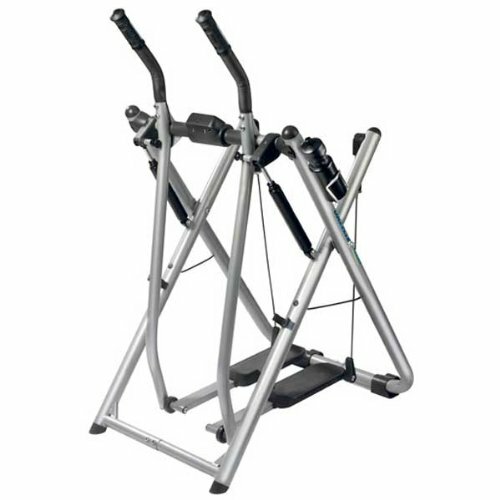 The Gazelle allows for a full range of motion, unlike competing ellipticals, and requires no forceful impact on knee joints or the spine during use. The equipment is designed specifically for home users, and is small enough to fit in most living rooms, home offices, or basement home gyms. Because of the dual-zone suspension paired with the Gazelle, the equipment notably works every single muscle group as users move back and forth during their workout. The Supreme comes with three different workout DVDs, which will help those new to the Gazelle leverage the full power of its features through exhilarating workouts for all fitness levels. The Gazelle Supreme was designed with ergonomics and long-term joint health in mind. That’s why it’s the only type of equipment to feature a dual suspension and the Smooth Glide system. As a result, there is virtually no impact on joints like the knees, the ankles, or the hips. There is also no long-term compression of the spine associated with Gazelle Supreme use. The full range of motion permitted by the dual-zone suspension allows users to run, walk, or jog while on the equipment, with smooth transitions that require no adjustment of tension, RPM, or MPH, as a treadmill or elliptical would enforce. That variability is actually key to the level of cardio training offered by the Gazelle Supreme, and it’s something that the included workout DVDs take advantage of at all levels. The equipment is inherently compact, with a smaller footprint than virtually any other type of home cardio equipment on the market. Most people install the Gazelle in their living rooms or offices, and still have enough room to get a great workout in throughout the day. A small, central LCD screen tracks equipment usage, and allows for the setup of 10 different workouts in conjunction with the included DVD set. These DVDs showcase the equipment’s ability to tighten and tone all major muscle groups, which is a feature no other cardio equipment on the market can offer to its users. Because there is no motor included with the Gazelle Supreme, or any Gazelle models currently on the market, there’s no way to “force” a cardio user to challenge themselves. This is actually not he case with treadmills and ellipticals, where tension levels or MPH rates can be adjusted to boost a heart rate almost automatically. With the Gazelle, the user must force themselves to run or walk as fast as necessary to reach their target zone. In this way, it’s like running outdoors. This is a downside for some users, who need the extra challenge, but it’s also a benefit for those who are ready to push themselves without the risks of added motors and machinery. The Gazelle is not easy to assemble alone, since many of its aluminum parts are long and continuously welded for maximum durability. For this reason, those considering the Gazelle should also consider when a friend or family member can help them put the pieces together to minimize potential headaches and frustration that might result otherwise. The Gazelle Supreme is a more versatile, smoother version of the original Gazelle. It offers up to 10 different workouts, the ability to easily transition form walking to jogging to running, and a compact construction that is necessary for today’s home gyms. In comparison to treadmills and ellipticals, the Gazelle is easier on the joints, easier to store, and actually easier to operate. The lack of a motor means that there is no inherent energy cost when using the equipment, and it also greatly reduces the amount of noise produced during a regular workout. This makes the Gazelle Supreme a perfect choice for home fitness enthusiasts who value joint health, cardio endurance, and quiet operation.